Weight and sizes of Platinum coins. 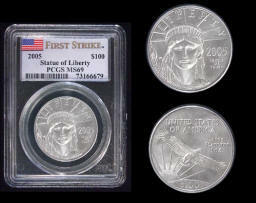 Beginning in 1997 the United States government began minting solid platinum coins to sell to investors and collectors. The word “eagle” in the name of this coin refers to the reverse design, which always depicts an eagle or eagles on it. The obverse (front) shows a close up portrait of the Statue of Liberty. All years and sizes have the same obverse design. Each coin features close up portrait of the Statue of Liberty’s head on the front (obverse). to see our Statue of Liberty Platinum Eagle coins for sale. There are both proof and Brilliant uncirculated versions made each year, in each size. The proofs have a W mint mark on the reverse, indicating they were minted at the West Point United States government mint. The Brilliant uncirculated don’t and were produced at the United States government mint in Philadelphia. Each is legal tender and backed by the United States government. Designer (1997 reverse) was Thomas D Rogers, Sr. Different designers created the proof reverses, because the proof reverse design varies each year. Proofs and uncirculated versions of the coins contain the same amount of Platinum. To view our limited supply of Platinum Eagle coins - click here. For more information about the metal platinum click here. Visit our resource page for other articles about coins. Click here for gold eagle coins. Click here for silver eagle coins.